Maki Fresh, Atlanta GA – Marie, Let's Eat! Every once in a while, you get so much conflicting information in one go that you seem certain to short-circuit. That’s what happened when our old friend David said that I needed to meet him for lunch at this quasi-Japanese fast casual place run by the team behind the Zoës Kitchen chain that makes a startlingly good hamburger. David usually knows what he’s talking about, even if the information sometimes defies common sense, so a couple of Fridays ago, I drove over to the Peachtree Battle Shopping Center to see about this burger. 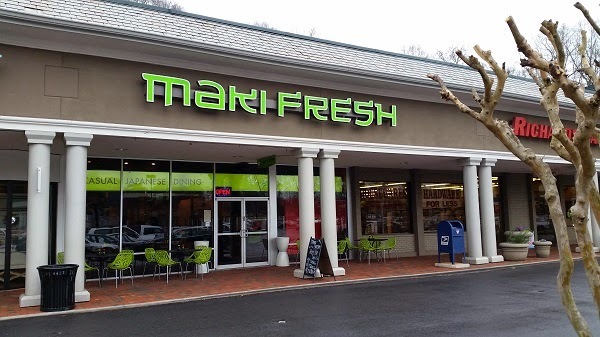 Maki Fresh is one of three restaurant chains founded by John Cassimus, and, like the better-known Zoës Kitchen – I’m not sure who stole that brand’s apostrophe, but I wish that they’d give it back – it is based in Birmingham. Zoës has grown to more than 130 locations in fifteen states over the last two decades. Maki Fresh is still a baby by comparison. There are only five stores so far: two in Birmingham and one each in Atlanta, Montgomery, and Tuscaloosa. A sixth store is opening in Huntsville soon. I was amused by Maki Fresh’s menu. They offer a few rice bowls that are not unlike what we see at Tin Drum Asiacafe, but not any noodle dishes like what they, or another, similar, company, Mama Fu’s, might offer. They also offer a small selection of sushi, and then the sliders. 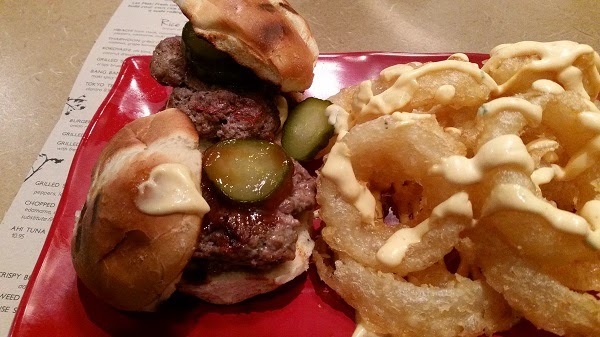 They have salmon and chicken sliders, but we were here to try the burgers, made from beef that comes from a farm in Florence AL and served with a heaping pile of tempura-battered onion rings. The burgers are indeed quite good. They come with a little bit of a sweet and spicy brown sauce and a few really tasty housemade pickles, and that’s all. Simplicity under a little bun, but they’re really flavorful. The onion rings are just tremendously good. I would have preferred to have the sauce on the side to dip them, but that’s just a quibble. The rings are terrific, and whether you’re enjoying a burger or trying a rice bowl or sushi, you should definitely get a side of these. It was quite a pleasant surprise, since these burgers are clearly not the restaurant’s focus or signature. It looks like most of their business is quickly prepping sushi lunches for carry-out or catering orders, but the burgers and rings are definitely worth your time. The service was prompt, attentive, and amusingly playful, and I wouldn’t mind visiting again sometime. Posted on March 25, 2015 August 20, 2017 by Grant G.Posted in atlanta, burgers, georgia, japanese, regional chainsTagged atlanta, brookwood hills, burgers, georgia, japanese, regional chains.